REYKJAVIK, Iceland (JTA) — At a windswept harbor of this Nordic capital, a bearded man wearing a black hat dips eating utensils into the icy water while hissing from pain induced by the bitter cold. Perplexed by the spectacle, a caretaker helpfully offers to let the man and his three companions use a washing basin to clean their dishes instead of precariously bending over the freezing water. Feldman and his companions, a journalist and two relatives who are visiting him here for the holidays, haul the wet dishes back to a car parked at the foot of one of the many snow-capped volcanoes surrounding this gray but picturesque capital city. The exchange last week was Feldman’s first attempt since registering as a resident of Iceland at explaining to a local a potentially awkward Jewish religious custom: in this case, “tevilat kelim” — immersing utensils acquired from non-Jews to make them kosher. But it won’t be the last explanation coming from the New York native, who this year became Iceland’s first resident rabbi in documented history. Feldman and his wife, Mushky, and their two small daughters settled in the country as its parliament prepares to vote on a bill that would outlaw nonmedical circumcision of boys. According to Feldman, the issue is not rooted in any hostility to Judaism in Iceland. Hotly opposed by the several hundred Jews and Muslims who live in this Christian nation of 330,000 citizens, the bill has wide support in the parliament and population, according to polls, and is expected to pass when brought to a vote at a date that has yet to be determined. This is part of the reason that leaders of European Jewry view the bill as a dangerous precedent amid a two-pronged attack on fundamental customs of Judaism and Islam – including circumcision and ritual slaughter of animals, which already is illegal in Iceland. As European nationalists hostile to Islam or Judaism target such customs, so do secularists and progressives who find the rituals intolerably cruel. In the rest of Europe, the debate about such bans is informed by the continent’s sad history of centuries of virulent anti-Semitism. At the same time, she shares the reservations of many Jewish mothers with regard to circumcision. “It’s pretty shocking, I don’t feel 100 percent comfortable with it, either,” said Har-Meshi, a successful jeweler who first came to Iceland as a tourist in 1986 and married a local non-Jew. Her teenage sons suffered taunts at school and “don’t feel comfortable showering in public” in a country that had fewer than 20 nonmedical circumcisions of boys since 2007, she added. 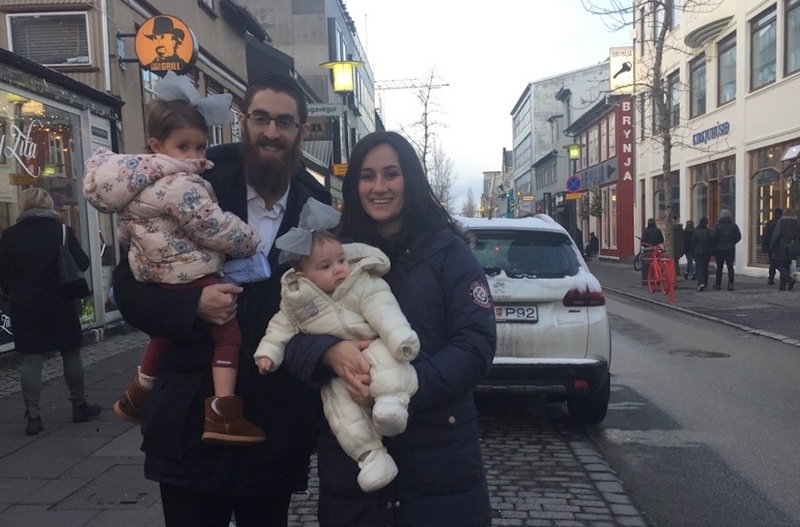 Against this backdrop, the arrival of a Chabad rabbi to Iceland is “great news,” said Mike Levin, a Chicago native who is the unofficial leader of the Jewish community of Iceland. Judaism is not among Iceland’s recognized state religions, so there is no way of gaining official status for his community. A group of a few dozen people without a synagogue, they celebrate Jewish holidays and events together at hotels, restaurants, picnics and at each other’s homes. Some years, community members brought leavened bread to get-togethers on Passover, when the consumption of such food is forbidden, Levin and Har-Meshi recalled. But other events were supervised by visiting rabbis from Chabad, who imposed a strictness that was foreign and unwelcome at this highly secularized community, where the Feldmans are the only observant members. Unlike the mink whale meat that is sold here in many supermarkets and restaurants, kosher meat is nowhere to be found in Iceland. But it does have world-famous kosher fish, most notably salmon. It was the main course at one of the largest Passover seders in the island nation’s history: a gathering of 100 last week at a local hotel, followed by a second seder for 50 people. The Feldmans said they are looking into opening a Chabad house and synagogue. In parallel, they are negotiating the import of kosher meat through local distributors. They represent a Hasidic movement with a mission to build Jewish communities in sometimes unlikely places. Levin, a carpenter in training who recently sold his popular catering firm for offices, said he is also “happy to be relieved” of the duties that come with leading a small Jewish community, with the usual bickering and logistical problems they entail. A follower of Conservative Judaism with cantorial skills, Levin said he never really sought to become the national leader of a Jewish community. “But someone had to do it,” he said. The proposed ban on circumcision, though, risks undoing decades of community building, Levin said. “It definitely doesn’t feel good. It sends a bad message,” he said. The leaders of the Jewish communities of four Nordic countries warned in a joint statement that a ban “will guarantee” that no Jewish community is established in Iceland and make it “the only country to ban one of the most central, if not the most central rite in the Jewish tradition in modern times.” The Feb. 13 statement also noted how the Nazis imposed bans on circumcision. Iceland, however, is hardly the only European country where Jewish circumcision, or milah, and ritual slaughter, or shechitah, are being attacked. A law banning shechitah passed in the Netherlands in 2011. Tellingly, it was submitted by the ultra-progressive and small Party for the Animals, but it passed thanks to the support of the large and populist Party for Freedom – an anti-Islam movement. Ultimately the law was scrapped by the Dutch Senate. Last year in Belgium, shechitah was banned in two of the country’s three regions with similar alliances. In Sweden, where progressives have spoken out for years against ritual circumcision, a draft motion against it was submitted to parliament in 2013 by a far-right, anti-Islam party. Iceland for the first time is seeing the arrival of relatively large numbers of Muslims – asylum seekers and other immigrants, often from the war-torn Middle East. “This comes with some tensions,” Har-Meshi said. Still, xenophobia appears to have had a negligible role in Iceland’s bill on circumcision, which lawmakers from four political parties introduced in January. Together, the parties account for 46 percent of the parliament’s 63 seats. In Denmark, a petition favoring a milah ban has received 68 percent of its target of 50,000 signatures. Once the target number is reached – organizers have until August to collect signatures — the petition will go up for a vote as a draft resolution in the Danish parliament. Stopping short of calling the proposed ban in Iceland a form of anti-Semitism, Baker said, “We have acknowledged the kind of public discourse that accompanies these debates” – a reference to an anti-Semitic caricature that appeared in 2013 in a Norwegian paper, among other materials. Occurring simultaneously with efforts to ban ritual slaughter, the campaigns to ban circumcision in Iceland and Denmark are the latest development in an escalation that occurred in 2012, when a German court in Cologne ruled that ritual circumcision of minors amounted to a criminal act of child abuse. The ruling triggered temporary bans in Austria and Switzerland but was overturned. Seen in this context, it’s easy to understand why Jewish communities are up in arms over the bill in Iceland, Baker said in an address in Vienna on Feb. 20. He also noted that the audience for his talk outnumbered Iceland’s Jewish population, drawing chuckles.